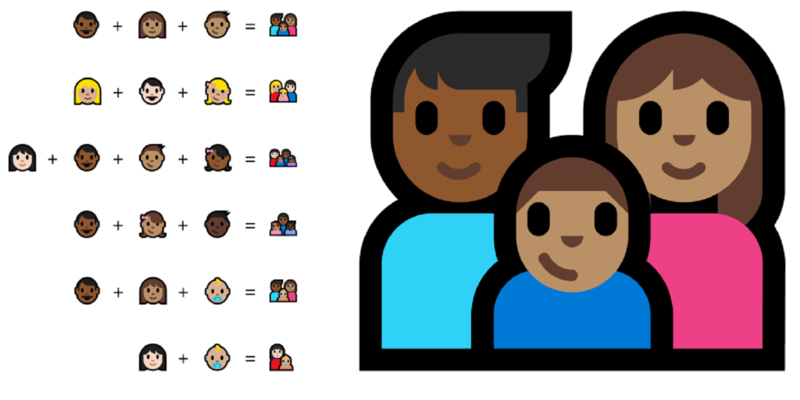 Microsoft has explained how it redesigned its Emoji keyset to include LGB families and couples. For the Windows 10 Anniversary Update last month, the company re-designed its entire emoji set “from the bottom-up with universality at its heart”. In a blog post, Danielle McClune of Microsoft explained: “The Microsoft Design Language Team embarked on Project Emoji, redesigning the emoji set from scratch in under a year. From early sketches to creating a new scripting method, the team knew only emoji. One of the core aims of the update was the concept of making emojis, which previously only included set variants of ‘family’ and ‘couple’ symbols, reflect the world today. The programmers designed the new system to use different modifiers to allow customisable emoji – in the same way that emojis already sometimes allow race to be customised across all platforms. It explains “There are [already] five skin tones to select in certain people emoji, rather than just the standard yellow. But these modifiers can be applied in endless combinations, and the new Microsoft emoji take advantage of that. “So if you’re a single mother with three kids, you’ll be able to create that image. If your husband is dark-toned and you’re light-toned and your two kids are a blend of both, you can apply all of those modifiers to create your own personal family emoji, one that’s sincerely representative. Microsoft Graphic Designer Mike LaJoie said: “It was very important to us that we give the designers the freedom to design within the style no matter how complex the designs were. The changes so far only extend to the Windows 10 ecosystem. The Unicode Consortium develops the universal standard for emojis, and would be responsible for making wider changes. Is Russia really going to ban Facebook over its ‘gay’ emojis?